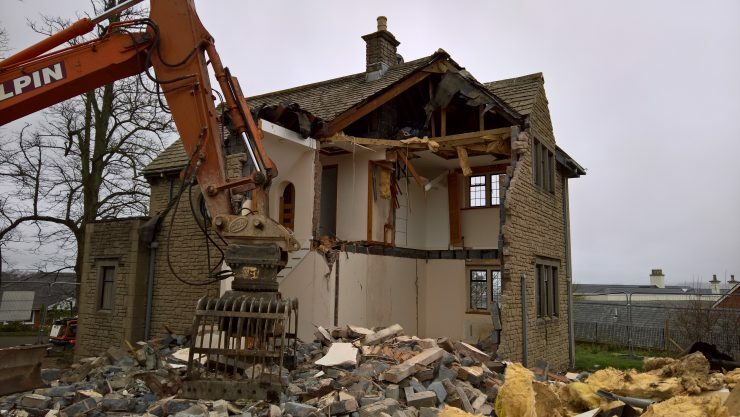 Our project The Lodge in Lympstone, East Devon has reached an exciting stage as demolition is currently underway with Gilpin Demolition on site! This intriguing project which started out as a extension and refurbishment of the existing building, will now see the current ‘ugly duckling’ property demolished and replaced with a modern and well thoughtout home set within a comprehensive landscaping scheme. After demolition the construction stage of the project will progress with RBL Homes. The proposed design takes advantage of the views over the Exe Estuary, a first floor terrace allows an area for the owners to enjoy the views. Just below the terrace, utilising the natural level change in the topography, will be a sunken garden, a private and intimate space with a fire pit. Keep an eye on our Facebook and Twitter feeds for more images from site through the demoltion and construction!